Brownies, that rich blend of cake and cookie that feels amazing in your mouth and leaves you craving more. All brownies have chocolate so thick and rich they should be illegal. Brownie Day is your chance to get in and indulge in all that decadent goodness you’ve avoided the rest of the year., or at least an opportunity to go into some serious brownie overload. They were first served at the Palmer House Hotel in Chicago in the late 1800’s. The same recipe , filled with walnuts and covered with an apricot glaze, is still served there today. The best way to celebrate Brownie Day is to indulge and encourage your favorite people to experience the chocolate brownie high. And we have just the brownies for that purpose. 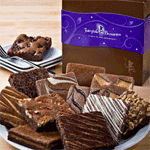 Check out our assortments of Fairytale Brownies that can be delivered to your door. You’ll want Brownie Day to be every day of the year.